Animal Wildlife | Common Buzzard | The common buzzard is a medium sized raptor, most commonly found throughout Europe and Russia. Despite rapid declines in the UK's common buzzard population numbers a couple of hundred years ago, the common buzzard is now the most common bird of prey in Britain. 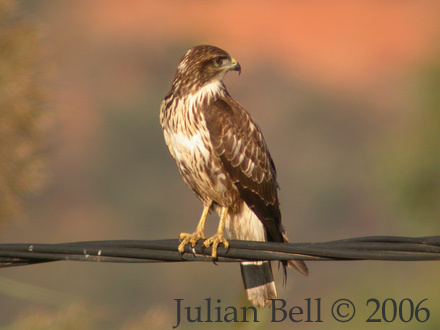 The common buzzard is found throughout Europe and Russia and also in parts of Asia and Northern Africa, where the common buzzard spends the cooler winter months. 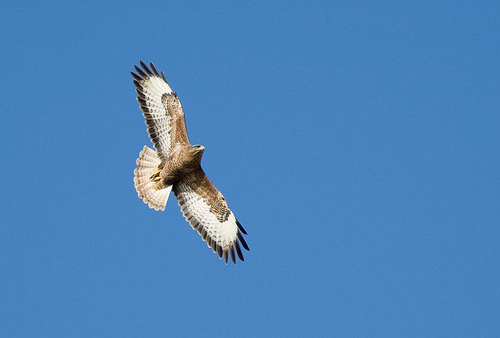 The common buzzard is found in a variety of habitats particularly woodland, moorland, scrub, pasture, arable, marsh bog, villages and even in towns and cities. Like other medium to large sized birds of prey, the common buzzard is a generally solitary animal, hunting and feeding alone. However, it is not uncommon to see small groups of common buzzards flying together when migrating, with as many as 30 common buzzards being spotted at once. The common buzzard is quite large with broad, rounded wings, and a short neck and tail and when gliding or soaring it will often hold its wings in a 'V' shape. Common buzzards are variable in colour from dark brown to tan, although all have dark wingtips and a finely barred tail. The call of the common buzzard resembles a mewing sound and can easily be mistaken for a cat. The common buzzard is a large and opportunistic predator, surviving on a purely carnivorous diet. 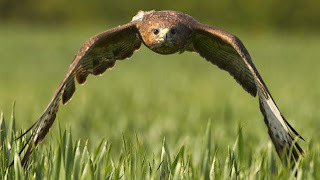 The common buzzard primarily preys on small mammals (such as rodents) and birds, along with a variety of other animals including insects, earthworms, snakes and carrion. 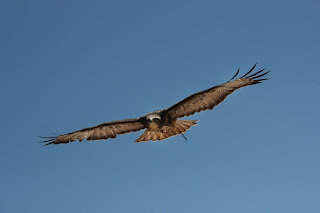 Due to the fact that the common buzzard is a fast and effective flyer, the common buzzard has few predators in the skies besides larger birds of prey such as eagles. On land however, the common buzzard is preyed upon by a number of ground-dwelling predators including wildcats and foxes. Common buzzard pairs are known to mate for life and make their nest in plentiful habitats such as on the outskirts of forest or woodland. The female common buzzard lays 2 to 4 eggs which hatch after being incubated by her for about 1 month. The common buzzard chicks leave the nest (fledge) when they are about 45 days old, after being cared for by their parents (mainly the mother). Despite once being nearly wiped out in the United Kingdom, today common buzzard populations are now thriving not only here but also across Europe, with the common buzzard being Europe's second most common raptor behind the common kestrel. 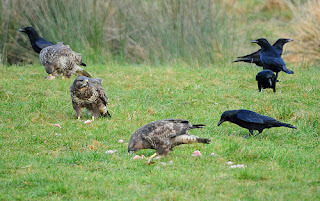 0 Response to "Common Buzzard"